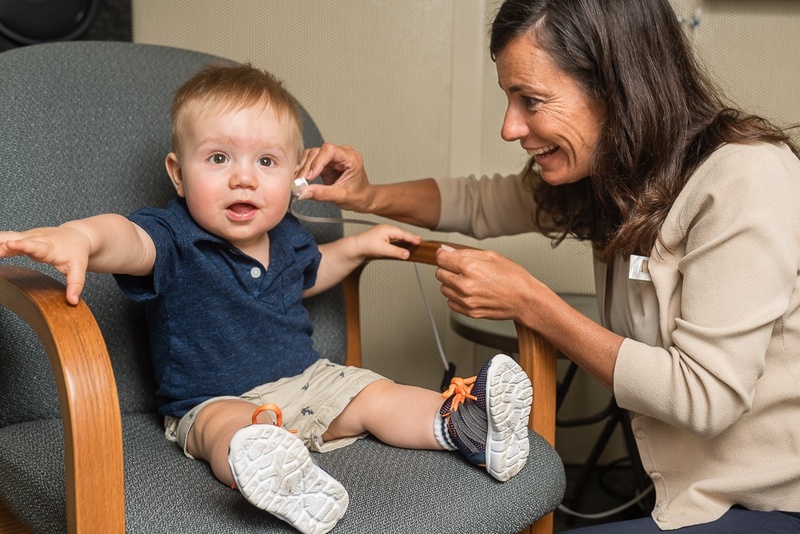 Diagnosis - Hearing Evaluation Services of Buffalo, Inc.
At Hearing Evaluation Services (HES), we believe that effective treatment begins with a thorough diagnosis of your child’s hearing. By clearly identifying the cause of your child’s hearing loss, our audiologists are able to develop a comprehensive and effective treatment plan that allows your child to succeed developmentally, academically, and socially. Having a large staff of experienced and knowledgeable audiologists allows us to to have specialists in areas such as pediatric hearing. Therefore, your child will be in the care of a pediatric specialist who can address any questions or concerns you may have. Your child’s hearing evaluation will be analyzed in conjunction with his or her medical history and a physical from their pediatrician. This extensive process allows us to consider all possible causes of hearing loss. There are many different types of non-invasive hearing tests. Some tests can be used on all children, while others are dependent on your child’s age and level of understanding. Below we have indicated the various testing methods suitable for children in each age group. Newborns are given a hearing screening almost immediately after birth; it is required by law before they leave the hospital. If a screening is failed, further testing by an audiologist is needed. Ideally, hearing loss in babies should be identified by three months of age so that treatment can begin before the baby is six months – a very important time for speech and language development. The child is shown how to perform a repetitive play task each time he or she hears a sound. For example, a child may be encouraged to build a tower with blocks or place a peg in a pegboard. Accurate ear-specific information can be obtained when the child wears headphones or a bone conduction oscillator. During this hearing test, the child raises his or her hand, or pushes a button, upon hearing a tone – the same as with adults. A child that is resting quietly or sleeping can have their hearing tested at any age. When the ear detects a sound, electrical nerve impulses relay information to the brain. These electrical impulses can be measured and used to determine how loud sound has to be in order for the child to hear. For this test, sounds such as clicks and tones are presented to the child’s ear and the electrical response is measured to determine which sounds the child heard. Committed to staying abreast with advancements in testing technology, HES is proud to offer the latest system in ABR testing. Our ABR system is wireless, eliminating the need for sleeping or sedation during testing. We can test children whether they’re asleep, playing, coloring and even eating. Visit Auditory Brainstem Response to learn more about the testing procedure. Visually Reinforced Audiometry is performed while the child is seated on a parent’s lap, while sounds are presented either through loudspeakers or earphones. When a tone or speech is perceived, the child will turn his or her head to locate the sound. This head-turn response is rewarded by the activation of a lighted toy mounted near the loudspeakers, which encourages the child to respond (turn their head) each time a sound is heard. For children who are unable or unwilling to participate in visual reinforced audiometry, Otoacoustic Emissions (OAE) can provide information about inner ear functioning. OAE testing is especially useful on newborns and infants because it doesn’t require a verbal response, or voluntary participation. OAEs are tiny sounds generated by the movement of outer hair cells in the inner ear when stimulated by a sound. We can perform OAE testing while a child is asleep, awake, playing or eating. OAE testing is a noninvasive test, during which, an audiologist will place a small probe into the child’s ear canal to record OAEs. OAEs are absent when there is a mild sensorineural hearing loss of 30dB or greater, or when middle ear fluid is present. Therefore, present OAEs imply normal inner ear function. Tympanometry is a test used to evaluate the middle ear and the mobility of the tympanic membrane (the eardrum). It can detect problems like fluid, earwax or a perforated eardrum that may impair your child’s hearing. Tympanometry is commonly used on children to test for the presence of otitis media with effusion (OME), which is common in children. OME occurs when fluid remains trapped in the inner ear following an infection. During this test, an audiologist will stick a pressurized probe into your child’s ear. It measures the eardrum’s response to change in pressure. Air pressure is applied to the eardrum, moving it back and forth. The device measures how well the eardrum moves back and forth from its resting position, which helps determine if the eardrum is too stiff or too mobile. If the eardrum is too stiff, that could mean there is fluid behind it. Tympanometry also measures the amount of space in the ear canal. If there is an open pressure equalization tube (PE tube) or the eardrum is ruptured, then the space will be larger than normal. If you suspect your child may be suffering with a hearing loss, early testing and diagnosis can ensure your child is treated, and able to excel academically and socially.